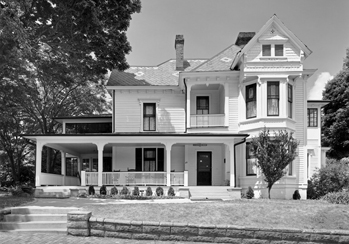 The Thomas Wolfe Memorial, located in Asheville, is centered around the rambling Victorian home where the novelist spent his childhood and adolescence. The house was built in 1883, in the Queen Anne style, and enlarged many times, as Wolfe's mother operated it as a boardinghouse called "Old Kentucky Home" for several decades starting in 1906. Wolfe was born on 3 Oct. 1900 in a smaller house that stood two blocks away, but Old Kentucky Home served as the model for the boardinghouse named "Dixieland" in his epic autobiographical novel, Look Homeward, Angel (1929). The rooms of Old Kentucky Home have been preserved almost intact, with the original Wolfe family pieces arranged much as they were during Wolfe's youth. At first frowned upon in his hometown for the unflattering portrait he painted of it in his novels (Look Homeward, Angel was banned from the Asheville public library for seven years), Wolfe was later celebrated as one of the city's most famous citizens. His youthful home came to be seen as worth preserving as part of the nation's literary history. A classic of twentieth-century Americana, the house has been preserved as an attraction for people from around the world since 1971 as a National Historic Landmark and since 1976 as a North Carolina State Historic Site. In 1998 a fire severely damaged many of the house's rooms. A number of artifacts and furnishings were subsequently restored, and architects rebuilt the damaged home. The house was closed to visitors for several years, although the visitors center, exhibit hall, and audiovisual program remained open, and the site continued to host special events. All sections of the Thomas Wolf Memorial were reopened in 2004. Wilson Angley, "Historical Research Report: Thomas Wolfe and the Old Kentucky Home" (30 Oct. 1974). David H. Donald, Look Homeward: A Life of Thomas Wolfe (1987). Richard F. Knapp, ed., North Carolina's State Historic Sites: A Brief History and Status Report (1995). George W. McCoy, "Asheville and Thomas Wolfe," NCHR 30 (April 1953). Thomas Wolfe Memorial, NC Historic Site: http://www.wolfememorial.com/.